Spotlight Sunburn: And don't call me Shirley. Results of the rag rolling experiment. They're much tighter than I expected them to be, so next time we'll attempt fewer rags and looser knots. The good part about these rollers is that there is zero product involved, so it can't possibly damage my hair. 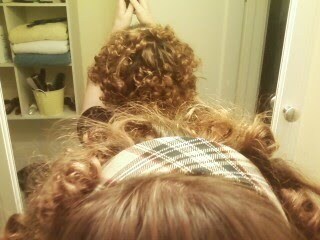 They are very much Little Orphan Annie/Shirley Temple curls - intense to the max, and my hair is at my chin. I didn't expect my hair to curl up that short! Whether or not it's anything stylish, it's quite fun. My hair is never this bouncy. 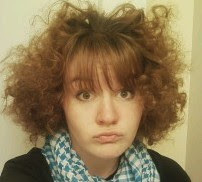 leave the house I'll be brushing it out and combing it to see if it doesn't just turn into a giant frizzy mess. My friends were a little like "WTF" and I was like "It's fun, why not," but I wish stylistic deviations were appreciated more. It was a pain to tie them all up, but at least I know that this method will put a curl into my hair and keep it, somehow. So now it's just for some tweaking and we'll see if I can't get the light curls I'm looking for. 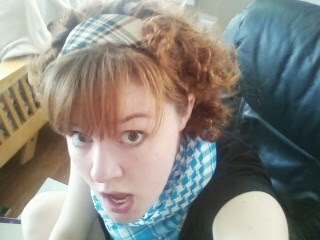 My hair has evolved into a level 2 disaster, also known as THE WHITE GIRL FRO. Incredibly rare in the wild, this creature runs the risk of being mistaken for a wig or a rat's nest, or both.